French forensics police search for evidence outside a building in Saint-Denis, where special forces raided an appartment, hunting those behind the attacks that claimed 129 lives in Paris last week, Nov. 18, 2015. The suspected Islamist militants targeted in a Paris police raid early Wednesday were a terror unit capable of planning a new attack, Paris Prosecutor Francois Molins said. "A new team of terrorists was neutralized and all indications are that given their arms, their organizational structure and their determination, the commando could have struck," Molins said. He confirmed the raid was called after phone taps and surveillance information led authorities to believe Abdelhamid Abaaoud, the suspected mastermind behind the Paris attacks, might have been in the apartment in Saint-Denis. The raid took place about 2 kilometers from the soccer stadium that was one of the sites attacked last week. While he did not confirm whether Abaaoud was at the apartment in the central part of town, Molins said Abaaoud, a Belgian national of Moroccan descent, was not among those arrested during the operation in Saint-Denis. French soldiers secure the area as shots are exchanged in Saint-Denis, France, near Paris, Nov. 18, 2015, during an operation to catch fugitives from Friday night's deadly attacks in the French capital. "As of now, the identities of those who were arrested in the building are not yet formally known, but I can specify that Abdelhamid Abaaoud and (fugitive attacker) Salah Abdeslam are not among those we have in custody," he said. Molins told reporters investigators were working on determining the identities of those killed and arrested during the raid, which ended after seven hours Wednesday. Three police officers were injured and a police dog was killed during the raid. He said nearly 5,000 rounds of munitions were fired into the apartment. Early reports said two people, including a woman who detonated an explosives vest, were killed and seven others arrested, with the fate of Abaaoud unclear. However, later Wednesday Molins did not give an exact number of dead, and said eight people had been arrested. Neither Molins nor French Interior Minister Bernard Cazeneuve would say whether some attackers might still be on the loose. Speaking shortly after the siege ended, President Francois Hollande said France is “at war” with terrorism, but warned against overreactions. “No xenophobic, anti-Semite, anti-Muslim act must be tolerated," he said. Speaking to a gathering of French mayors, Hollande said he wants to build a large coalition to target the Islamic State militants, and outlined a series of measures to fight the group, which has claimed responsibility for the attack. He has proposed modifying the French constitution to better deal with terrorism and other crises, such as allowing dual nationals to be stripped of their French citizenship if they were convicted of terrorism. 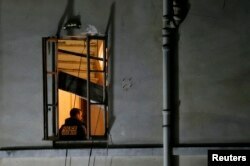 A member of French judicial police inspects the apartment raided by French police special forces earlier in Saint-Denis, near Paris, during an operation to catch fugitives from Friday night's deadly attacks in the French capital, Nov. 18, 2015. Hollande also said a bill to extend France's state of emergency for three months includes a measure that enables authorities to close "any association or gathering," which includes mosques and community groups, where people are "glorifying terrorism" or encouraging people to carry out terrorist acts. The bill is to be debated in the Cabinet Wednesday, the lower house Thursday and at the Senate Friday. A vote is expected by the end of the week. Hollande's proposals have drawn criticism from rights advocates. The president added that France will keep its promise to take in 30,000 refugees over the next two years. However, he said their backgrounds would be checked thoroughly to ensure they do not pose a threat. French warplanes mounted a third day of airstrikes against the militant group in Syria, targeting its de facto capital in Raqqa. The defense ministry said 10 of its jets took part in the latest airstrikes and bombed two command centers. The Britain-based Syrian Observatory for Human Rights said Wednesday 33 Islamic State members had been killed by French and other military airstrikes, in the past three days. Hollande said the French aircraft carrier Charles de Gaulle is being sent to aid French military operations against the Islamic State group. Hollande is scheduled to meet with U.S. President Barack Obama in Washington November 24 to discuss ways to intensify the campaign targeting the Islamic State group. He is to meet with Russian President Vladimir Putin in Moscow November 26 to discuss the same issues. Authorities are also looking for other suspects tied to the November 13 attacks that killed 129 people and injured more than 300 others. Officials said Wednesday that all 129 victims had been identified. Suspected mastermind Abaaoud, who has been linked to other terrorist operations, was previously reported to be in Syria. 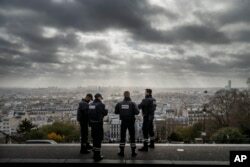 The city of Paris stretches out before French police officers as they stand guard near the church of Sacre Coeur, on top of the Montmartre hill, Nov. 18, 2015. Reports suggest he may have traveled to Europe at least once this year, underscoring larger concerns about intelligence lapses and the security risk posed by returning jihadists. Three officials, who spoke late Tuesday on the condition of anonymity because they were not authorized to provide details about the ongoing investigation, said an analysis of Friday's attacks indicated one person directly involved was unaccounted for. The officials said that fugitive has not been identified. French and Belgian authorities have issued a warrant for Belgian-born Abdeslam, whose brother was among the attackers who died. Seven attackers died Friday night, three around the national stadium, three inside the Bataclan concert venue, and one at a restaurant. Overnight raids by French police across France have resulted in 25 arrests and the seizure of 34 weapons. 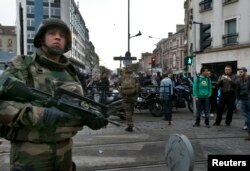 In all, French police have carried out 414 raids and made 60 arrests while seizing 75 weapons since Friday. In addition to dozens of arrests, 118 more people have been placed under house arrest in another of the new powers permitted under France declared a state of emergency on Saturday. Air France confirmed two of its flights from the U.S. to Paris were diverted and landed safely late Tuesday after being the subjects of anonymous threats. The airline did not describe the specific threats, which came in after the planes took off, but said it decided to have them land "as a precautionary measure and to conduct all security checks." One flight from Los Angeles landed in Salt Lake City, Utah, and the Federal Bureau of Investigation said in a statement that authorities found no credible threat. The other flight, which took off from Washington, was diverted to Halifax, Canada. Chris Hannas and Mia Bush contributed to this report from Washington.